With the MTN Network, you wouldn’t have to spend a single dime to stream live shows and stay up to day with scheduled TV programmes on Cruise TV. Cruise TV is a newly launched streaming network, developed to showcase and promote African culture, utilizing the extensive reach of digital technology to reach out to as many people as possible. The platform features a wide range of TV shows that preach the African cultural heritage to all and sundry, for all ages and races across Africa. Cruise TV offers 24/7 entertainment and it has varieties of programmes which you can check out from the schedule category. The amazing part is that using the Cruise tv streaming app with any MTN sim is 100% data free. It doesn’t require your data. With no data, no airtime, you stream flawlessly. For PC users, log on to http://cruisetvnigeria.com/ to stream live. 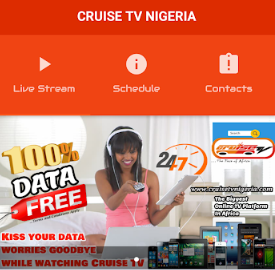 Note: Cruise TV is data free for only MTN Subscribers in Nigeria. To start streaming for free, ensure there is no data on your MTN SIM card.